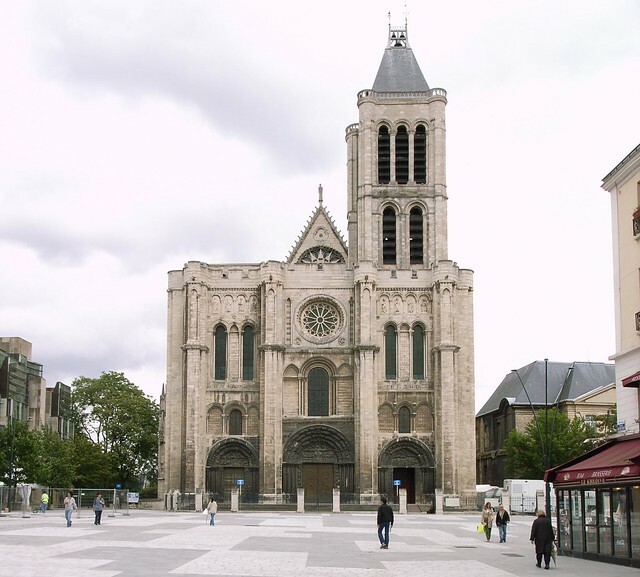 Saint Denis Basilica, built under the supervision of Abbot Suger, heralded Europe’s shift from Romanesque to Gothic. The difference can be seen in its pointed arch, the ribbed vault, the ambulatory with radiating chapels, the clustered columns supporting ribs springing in different directions and the flying buttresses which enabled the insertion of large clerestory windows. In the 1120’s, Peter Abelard called the abbey at Denis “completely worldly and depraved,” and accused the monks of “intolerably foul practices, both in private and in public.” a Abbot Suger was determined to reform the Benedictine Order at Saint-Denis. The monks were harassed by politicians and invaders, and often became “grand and profane” and struggled to receive classical learning. b Saint Denis provided a place for this reformation. “The ‘easy and concordant harmony’, or the ‘miraculous peace’ that Augustine saw as the primitive condition of the unfallen human nature, will only be restored, both in the individual person and in human society, in the heavenly society, in the heavenly City of the saints…. Not that monks were immune to the effects of original sin, or a monastic community exempt from its disruptive social consequences; but in the monastic community Augustine saw a kind of prefiguring of the heavenly City…. The church and monastary became the center of the city both culturally and socially. Though Romanesque churches were popular elsewhere in Europe, the Ile-de-France never had a firm style to build on. Because of this there were less assumptions made about what a church should be and a new emphasis on local traditions led to uniqueness and inovation. Rib vaults date back to 1100 in Normandy. 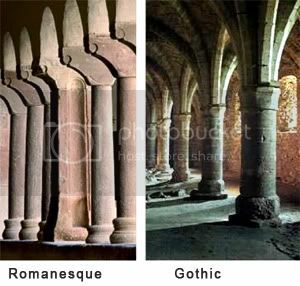 Pointed arches were found in Normandy and Burgundy. Cylindrical columns were in ancient Rome in Egypt before that. 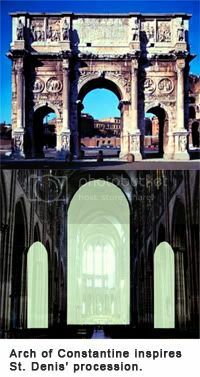 St. Denise derived the triple portal of the west front from the arch of Constantine in Rome. The innovative rose window on the front façade of St Denis echoed the Roman Arch of Constantine which had a three-part division and three large portals to ease the problem of congestion. The architect pulled many things from international sources to make something completely new. The modern vault could be repeated to create a bay. It’s units are segmented by windows, similarly to how the Romans treated their temples. Rational modulation opened new possibilities in form. Suger’s solved this by reducing the the extravagance and exaggeration, cleaning up the lines to their minimal essence and pushing this harmonious form further. The new style would be less grandiose, more profound. Carrying on this Romanesque value, the Gothic looks back to the lost fathers of learning in Rome and Greece for knowledge and wisdm. The construction of Saint Denis and other large churches helped bring peace between France and the Vatican. Local unfriendly rulers, like Henry’s relative Thibaut, were pacified and united under a single ruler. The building emphasizes relationships of parts toward a total unity. Each detail reinforces an over-arching vision: ”It is the facade of Saint-Denis that marks the beginning of a new epoch… In the facade of Saint-Denis the three doorways are fused into a unity by the slight predominance of the central one, and by the uniform use of all-round figures in the jambs…. the three doorways are incorporated into the vertical system of the facade with its towers; we see the horizontal unity of the lower part simultaneously with the unity of the whole facade. As a neo-Platonic celestial Jerusalem, the cathedral sought to reveal the invisible nature of the universe with symbolism. Unlike how we understand symbolism today, Gothic symbolism avoided mimicry. It used color, proportion, and other design elements to convey a moral reality. As local economies grew and regional leaders became more important to the national unity, the bishop seat became more and more powerful. The cathedral’s wealth came to represent that power. Mysticism was an important part of Suger’s vision. “Suger was heavily indebted to his reading of certain mystical treatises written by Dionysius the Areopagite (whom Syger and many of his contemporaries wrongly assumed was the Saint Denis for whom the abbey was named), a fifth-century Syrian monk whose works on mystical theology were strongly influenced by Neo-Platonic philosophers as well as by Christian doctrine.” r Suger saw the purity of light as the destination for the hierarchy of matter. But mysticism was tempered by rational thought and reasoning. The modern structural forms and architectural methods in Saint Denis contributed to a paradigm shift where the people became less mystically minded and more scientific. The revitalization of this monastic complex resulted in this desired result among the clergy. But is that really what Suger set out to do, or were political motivations more important and was he just post-rationalizing? The opulence he put into the building ran counter to the humbleness and material poorness that Bernard demanded is necessary to clean up religious corruption. So this is a building for every person? Something democratic? No. It does indicate, however, that the building was instantly relevant among all classes in the society… If what he says is correct. Bernard praised Suger for his achievement in revitalizing the monastary. 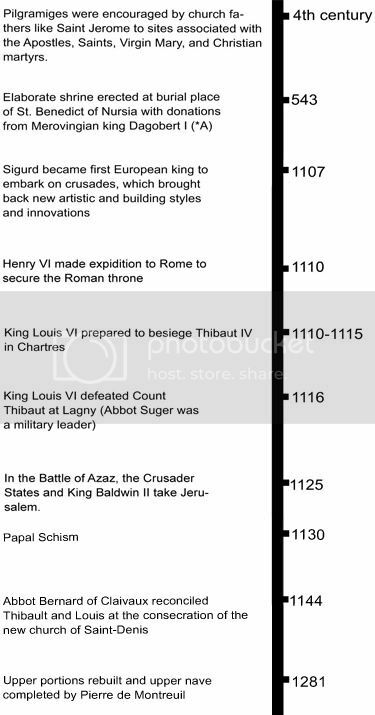 Bishop Fulbert – Commissioned Chartres Cathedral in 1020, requested funds from the King and other sources. Beranger – Fulbert’s architect for Chartres, who built with a Gothic plan as constrained by the early Romanesque structure, setting a precedence in Gothic for respecting previous styles. St. Bernard – Established a center for Cistercian Order of monks, and demanded humble simplicity. He became extremely influential and conducted political negotiations which involved Saint-Denis and led to its role. “…We know that peace negotiations were pursued at the consecration of the new choir, because St. Bernard wrote to Jocelyn of Soissons that he hoped to see him to prosecute them at a forthcoming appointed celebration, an ‘indicta celebritate’, at St. Denis.” [y] Influenced St. Denis. Eligius – A goldsmith by training, worked on many churches and cathedrals including St. Denis. Nicholas of Verdun – 1180-122 Goldsmith and Enamellist for the Shrine of the Three Kings at Cologne Cathedral. Gerard of Cremona – Translated many texts in the 12th century, especially from Arabic and Latin, to expand the learning and philosophy of Europe. Master Hugo – 1130-c.1150 Romanesque lay artist, made illustrations for the bible, made bronze doors for the western entry of the Abbey church. Gislebertus – 1120-1135 French Romanesque sculptor. He worked on the Cathedral of Saint Lazare at Autun, France – made expressive doorways, tympanums, and capitals. Saint Anselm of Canterbury – 1033 – 21 Benedictine monk, an Italian medieval philosopher, theologian, and church official. Founder of scholasticism. Saint Denis – 250 Christian martyr and venerated saint. A third century Bishop of Paris. Ibn Sīnā – 980 Completed 46 works on philosophy, medicine, theology, geometry, and astronomy. About 99 other influencial books can be attributed to Ibn Sina. Abu Rayhan Biruni – Founder of Indology, the father of geodesy, and “the first anthropologist”. One of the earliest leading exponents of the experimental scientific method, particularly for mechanics and mineralogy, a pioneer of comparative sociology and experimental psychology, and the first to conduct elaborate experiments related to astronomical phenomena. Alhazen – Contributed to the principles of optics, to anatomy, astronomy, engineering, mathematics, medicine, ophthalmology, philosophy, physics, psychology, visual perception, and to science in general with his introduction of the scientific method. People had new hope in their clergy and government, the economy picked up, international influences, and greater values for learning and rationalsim led to the magnificent form. The historical struggle against corruption and mystic fear came to an end and a new struggle against opulence and worldly realities began. The immensely popular Abbot Suger, who had served as a military leader for the king, put immense effort in the Saint Denis Basillica for the purpose of glorifying the nation and reforming the religious structure. The highly modern structure used technical innovations from far away to do something that had rarely been sought in architecture: to let architecture contribute to the program rather than just providing shelter and open space. 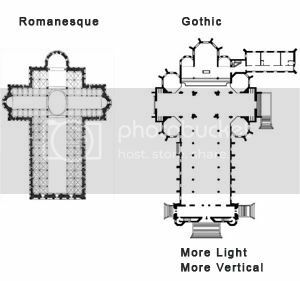 The architecture let in more light, it gestured the people toward the heavens, but most importantly it established itself as a very real symbol for the unseen world, for the moral and theological reality that couldn’t be seen in nature. People gained courage, and they became less content with not knowing the truths of their environment. Author and copyright owners for images are indicated below the images, with hotlink to source. Original authors are responsible for images. Images offered under same license and will be removed upon request. No author endorses this site. Images and writings that are original are copyrighted. This blog claims no authorship of projects presented & is only intended for educational and search purposes, and is not responsible for inaccuracies or unverified content. This site uses Google Analytics. Architecture Revived is a trademark.